Big Bang Theory, Sheldon Cooper's favorite victory cry, Bazinga! Our new Bazinga Shirt features the dynamic victory cry in blazing hot comic lettering with great colors that appeal to The Big Bang Theory show fans. Sheldon Cooper is a hilarious mainstay on the show and when he utters his catch phrase, "Bazinga" it always results in laughter. This one-of-a-kind Bazinga Shirt is one not to be missed. Fans of the show, The Big Bang Theory, love it's wacky comic typography and electric colors. 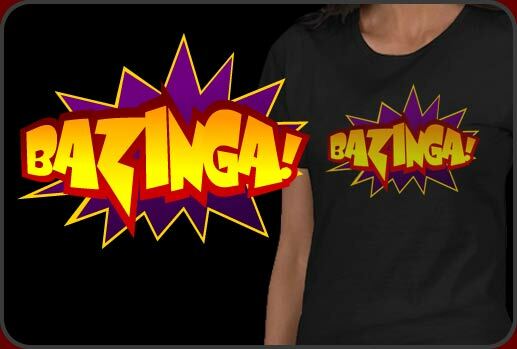 Our Bazinga Shirt is printed on many different types of shirts for men, women and children and we have our Bazinga Shirt design on several really cool items like hats, aprons, stickers and buttons too.